Walleye spinnerheads never stop attracting. When they fall, the blade turns. Slow-roll them along bottom, the blade thumps. Pump it, swim it, jump it. Flash goes everywhere. Try to hold it still. The blade sidles around, reflecting light. Spinnerheads never stop enticing, either. Enclaves of walleye hardhats around the country know the value of a spinnerhead (some call them "underspins"), but the potential seems largely forgotten. Makes no sense. Jigs catch walleyes. Spinner rigs catch walleyes. Combine the two and you somehow can't catch fish? A spinnerhead offers the best of both worlds. The jig stays in touch with the bait and the hook, unlike a rig. You never really know where the bait is in relation to the weight touching bottom with a rig. But a jig can incorporate that ultimate of all fish-catching inventions — a spinning blade. Thump, flash, set the hook. The original under-head spin is the famous Blakemore Road Runner, which eventually led to the Marabou Pro Road Runner. Buckeye Lures makes the depth-probing Su Spin Blade. Northland Tackle makes the Thumper Jig and the Thumper Crappie King. Blue Fox makes the Panfish Spinner Jig, Lindy makes the Dancin' Crappie Spin Jig. And you have propeller versions, like the Northland Whistler Jig. Combined with bait, feathers, or softbait, spinnerheads put a hurt on walleyes in current, along weedlines, on rocky points — anywhere they feed actively. If it's snaggy, don't bump. If it's clean, bump all you want. The key with spinnerheads is staying near bottom and not necessarily bumping into things, though the thump of a blade enhances the attraction of a bump. Most of the time, slow rolling a spinnerhead at a pace that keeps it just off bottom is all it takes. In snaggy areas, count it down to bottom so you can begin the next retrieve just before it hits. Pumping the bait upward at intervals, making the blade thump, is right in cloudy water or in the presence of highly active fish that show up 2 feet above bottom on sonar. Let it flash down to bottom again on a slack line, mosey it along for a few feet and pump it again. Troll it along weedlines, along the edge of mid-depth flats, and over rocky points. Letting the bait hit bottom sometimes creates a plume. A blade flashes through the murk. Swim it along slowly, rod tip down. When pumping a spinnerhead, just raise the rod tip fast enough to feel the blade working. The right tackle for most situations is a 7- to 7½-foot medium-light spinning rod with a light, long-cast reel. Even better is an 8-foot St. Croix Avid AVS 80MLM2, a long, light, fast rod that can protect 4-pound test from huge walleyes where they can't reach weeds or wood. With a tough but pliable mono (I use 4-pound Maxima Ultragreen in rocky lakes) the long rod launches for distance and perfectly swims 1/16- to 1/8-ounce spinnerheads when coupled with a 4-inch curlytail worm, grub, or Gulp! Leech. Around rocky shorelines, reefs, and points, I match jig weight to depth (1/16-ounce down to 8 feet in calm weather), then make long casts parallel to the contours active fish are prowling along — typically 4 to 15 feet, give or take a few, depending on clarity and wind. As the spinnerhead falls to bottom on a semi-slack line, the rod tip is pointed down. The first retrieve is a steady, slow turn of the reel handle, letting the jig touch rock every foot or three. Amazing how many walleyes respond to this simple, do-nothing retrieve. The advantages include relatively quick coverage or an area with minimal time spent rigging and maximum time is spent fishing, which means more walleyes in the boat. Keep it moving fast enough to clip the tops of the rocks and it seldom snags. If that simple tactic fails, try pumping the lure up a foot off bottom once for every 4 to 6 feet it travels, especially in waves or cloudy water — conditions where spinnerheads often outperform simple jigworms. One sleek new design, the Buckeye Lures Su Spin Blade, is offered in sizes up to 1/2-ounce, for probing deeper contours both horizontally and vertically. The added weight carries larger minnows and plastics into the strike zone when it's 20 feet down or deeper, and tandem willowleaf blades produce twice the flash and thump down where less light penetrates. A 7-foot medium-action-and-power rod and 8- to 10-pound mono serves better for deep duty. Another option spreading across North America from its home in Seward, Nebraska, is the ReelBait Flasher Jig, which already is popular in many western states. It's available in 1/8, 1/4, 3/8, 1/2, and 3/4 ounce. Most anglers couple it with livebait, but one of the hottest options in western reservoirs and rivers has been the combination of the jig with a softbait like the Berkley PowerBait 3-inch or 4-inch Minnow. The standard Flasher has a silver blade, but a red-blade version also is available, the Redtail Flasher Jig. River walleyes are targets for jigs with blades, too. Mature designs like the Northland Tackle Whistler Jig are just as effective in rivers today as when introduced. The propeller turns when the jig is held still near bottom while drifting in current, delivering an awesome trigger. These are open-water situations, away from weeds and wood. But spinnerheads won't whistle Dixie in cover either. The guys at Northland Tackle say pro staff member and walleye guide Brian "Bro" Brosdahl fills his pockets with Northland Thumper jigs every time he shows up at the factory. "I like to use them in all kinds of lakes," Brosdahl says. "The best time to use them is whenever walleyes are shallower than 12 feet. Deeper than that, the blade slows the drop too much. I use the 1/8-ouncer most of the time, but if it's windy I go up to the 1/4- or 3/8-ounce sizes. I tip them with a little Northland Mimic Minnow or curlytail, but most of time I tip with a crawler, a minnow, or a leech, in that order. The bait-saver barb won't let bait fall off. Most of the time I tip the 1/8-ounce Thumper with half a crawler, but sometimes I fold a whole crawler to make it look like a craw and that calls for the 1/4-ounce." Brosdahl has been a walleye guide in Minnesota for years, and he attributes many success stories to the Thumper. "I have clients that won't troll cranks or bottom bouncers and the Thumper is the way to trick them into trolling," he says. "I just keep the boat moving, telling them to let the jig sweep behind the boat before retrieving. They're getting bit without realizing they're trolling. But I'm not using them just for clients. I hardly use standard jigs any more. I've got Thumpers tied on every time I leave the dock. "I like the flashy minnow head," Brosdahl adds. "It looks like a shiner. The little spinner has dimples to refract light. I like to pitch Thumpers whenever possible, and the 3/8-ounce version worked well when I was faced with heavy winds in tournaments on Lake Oahe and Devil's Lake last year. On Devil's, I was working through submerged trees by making the Thumper weedless. It has a long enough shank to allow you to doublehook a fathead. Go out through the gill and back through the body in cover. That allows you to finesse it through wood better, and that little bit of flicker leads walleyes to the bait. I'm convinced the blade makes fish bite better. Trolling at .9 to 1.2 mph, you can distance a spinnerhead from the propwash and the boat, unlike a bottom bouncer. But the vertical part is underutilized. The Thumper is an awesome vertical jig. You rip or just twitch it and it has a lot going on with the flash and flutter of the blade." In winter, Brosdahl takes his Thumpers on the ice, too. "I wouldn't be without one jigging below a hole in the ice on those main-basin bites for walleyes," he says. "When a lively minnow swims, it makes the spinner flutter. Flicker and flash goes a long way. You don't need to make the blade turn for it to be effective." In open water, Brosdahl uses a 6-foot 6-inch medium-light St. Croix Avid, a Shimano Stradic 1000 reel, and 7-pound Northland Bionic Line in green camo. "It's hard for me to use a regular jig anymore," he says. "I use a Northland Thumper far more than a standard jig. I've been in crowds catching fish when other people weren't, so I know it pushes fish over the edge. I have Thumpers all over my boat, stuck in the carpet, hanging out of cup holders, dangling on the gunnel." Walleye pro Tommy Skarlis, record holder for the largest stringer ever weighed in at a walleye tournament, uses blades and jigs together in a different way to probe deeper into cover. "Adding a safety-pin style spinner to a jig essentially turns it into a walleye spinnerbait," he says. "The Beetle Spin concept was famous for a long time then faded, but we should see a huge rebirth with the water clearing up. You've got to get deeper into weeds and wood cover in clear water. The spinner arm protects the hook while adding flash. I like to feather them slowly through weededges or pitch 'em right into dense tangles of logs and branches in clear bodies of water." The key is to keep a jig-spinner moving. Stop the bait over the water and begin the retrieve as it splashes down to establish the correct position, with the hook up and the spinner arm in position to deflect wood and weeds. Allow it to fall on a tight line while slowly retrieving, then bump it gently through the cover on a horizontal plane. In wood, be gentle and it seldom snags. In weeds, ripping a jig-spinner free is a triggering maneuver. Let the bait fall when it pops free. Strikes often occur as the jig slowly settles back into a horizontal retrieve. But pitching isn't the only way to work a jig-spinner combo. "You can also jig it vertically," Skarlis says. "Cast it over the weeds, retrieve it slowly to a point directly below your rod tip then lift and drop. It's one of the most versatile and deadly walleye tactics I've come across since the Lindy Rig first appeared. "Lindy sells spinner blades as separate components," he says, "and I match them with Lindy Fuzz-E-Grubs or Live Bait Jigs. A Fuzz-E-Grub has that pulsating marabou. With a plastic grub or a live minnow, I add a stinger hook the same way I would with a spinnerbait. I always start fast with 1/4-ounce jigs and go up or down from there, depending on the mood of the fish. A 1/4-ounce jig falls through cover easier, but sometimes they want the slower fall of an 1/8-ounce jig. The Lindy Jig has a 3/16-ounce size, when 1/8 is too light but a 1/4 is too heavy. "The blade gives it flash and vibration, so I tip with straight tails in clear water," he says. "One of my favorites is a Gulp! Minnow. 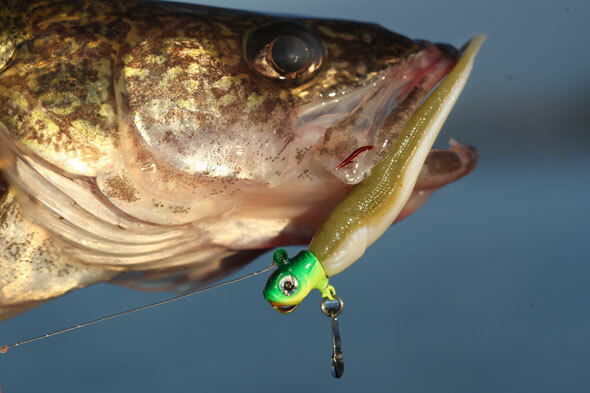 For more action in cloudier water I add a Berkley Power Grub to help walleyes find it." Skarlis accused me of prying things out of him. What does he expect from the media? Nothing's off the record: When things really get tough in wind and waves, he suspends a spinnerhead under a slipfloat. "The jig is going up and down in waves under the float," he says. "The waves are breaking up the light, and if it's cloudy out or the water is murky, it's dark down there. Having a blade on the jig is the sauce on the goose. I use a 1/16-ounce Lindy Dancin' Crappie Spin Jig tipped with a leech. Every time the jig rises and drops, that blade is working for you — drawing walleyes to the bait. "The jig spinner has become a favorite tool for a lot of walleye pros, including me," he adds. "With lakes clearing and more weedgrowth filling in the flats, there are invariably more walleyes in them. I'm seeing lots more walleyes now relating to grass edges and grass fields in rivers, too. Spinner-jig combos represent the next frontier in the walleye world right now." Wacky but versatile, spinnerheads and spinner jigs can be applied anytime, anywhere. Don't whistle Dixie on any good spots this year without trying one. You never know when that universal solvent — the turn of a blade — will make all the difference. Matt Straw, Brainerd, Minnesota, is an In-Fisherman Field Editor who has worked with the In-Fisherman staff for over two decades.